Let's hope future episodes tighten up the formula. apanese export Professor Layton speaks with a British accent, but in no way is he cheeky. Enter Britain-based Relentless Software with the Buzz trivia series that plays off a British archetype with the game's impudent host. A watcher of the BBC, I am able to pick up on his lingo and mannerisms, and my friends who can't quite keep up are charmed just the same. Relentless writes what they know and continues to do so with their new downloadable title Blue Toad Murder Files, complete with saucy narrator. It's a shame that the game's charm is its only masterful aspect. Like Professor Layton, Blue Toad is a series of single-screen puzzles (though, far fewer) separated by an unfolding story, and with each puzzling hurdle the player is brought closer to solving the whodunit. But here, it's deceivingly set up like a board game with a bird's eye view of the town Little Riddle acting as a hub for one to four competing players. 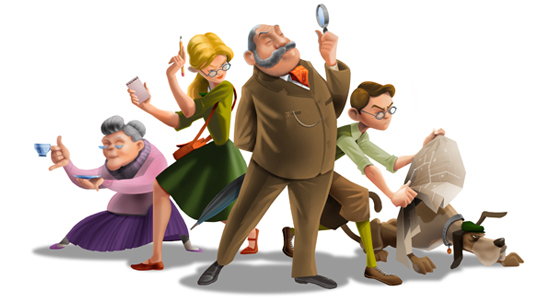 Entertaining, yes — but the game seems to lack fine-tuning everywhere except for its script and animation.But competition is relegated to players taking turns on their own puzzles, and if one player gets stumped, everybody has to wait patiently. There's a ticker, but it counts up and judges which medal the player receives for that particular puzzle. A more interesting system would have had players jumping in to solve a straggler's puzzle, and with that having to start the next puzzle giving the previous straggler a chance to jump in on theirs. Design decisions aside, Blue Toad seems to lack fine-tuning everywhere except for its script and animation. Being able to download multiple episodes and start them in any sequence implies that vital information from Episode One won't be spoiled in the first two minutes of Episode Two. But having played three-quarters of the way through One, I was joined by a second player, so I decided to start a new case to introduce a fresh batch of puzzles. But hey, check it out, the murderer from One gets revealed mere seconds after starting Two because of its bearing on the new plot. This basically crushed any motivation to go back to my saved play on One. It would have been nice to at least be warned about this. So unlike a board game, or even Buzz for that matter, replay value in Blue Toad is a foreign concept. Vague instructions for puzzles often plague later episodes as well. Professor Layton offers paragraphs of rules at times while Blue Toad makes due with a line or two. And more than once the line that is given is a riddle in itself. With a ticking clock, no hint system, and a room full of anxious friends, Blue Toad pecks at the good will earned by its charming King's English. Let's hope future episodes tighten up the formula and bring an alternative to gatherings short on Buzz trivia questions. I would have been a tad miffed by the way Relentless "spoiled" the first game in Episode 2's introductory moments as well. I've played through a number of episodic releases from Telltale Games, and each one seemed to be rather neatly packaged (never revealing too much about what happened in previous releases).